The latest addition to out retreat center Jiwa Damai is a fire place for spiritual rituals and ceremonies. 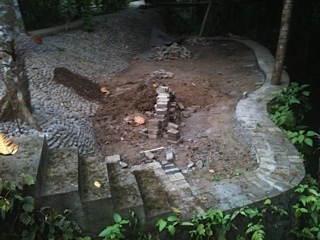 The fire place is being constructed close to our little water angel island in the back of the garden. 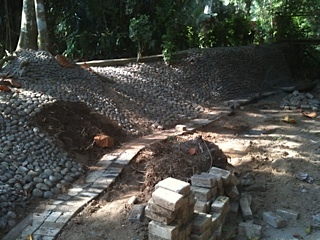 One wall is composed of local large pebbles. The floor will be made out of stone and grass. 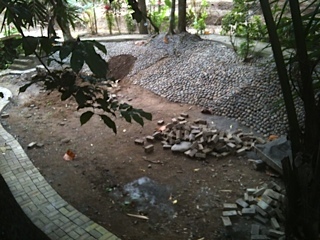 Once the floor is done, we will place 12 large stones to sit in a circle, with the fire pit in the center. We choose this area for the fire place, because all thebig trees are situated in good distance and a fire does not damage any trees or leaves above. 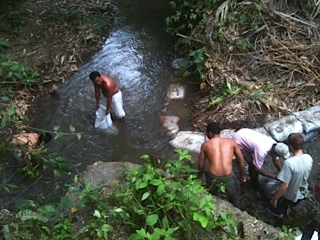 During the last very strong rainy season lots of damage was done on our premise at Jiwa Damai. The heavy rainfalls caused lots of erosion, especially at the banks of the small river which is flowing through the permaculture gardens. 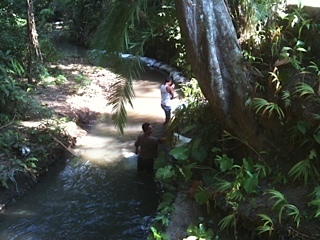 We had to take care of this erosion and stabilize the river banks. To reduce the powerful impact of the torrentious rains on our lands, we reinforced the borders of the river with sand bags. 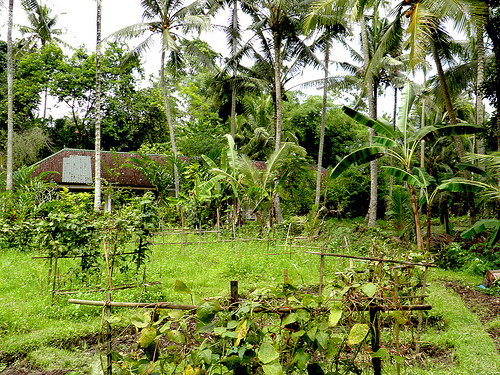 Next year Jiwa Damai will be hosting a Permaculture Certification Seminar with two internationally renowned permaculture designers: Rico Zook and Jeremiah Kidd. This is an intensive 17-days seminar , including hands-on experience in the gardens at Jiwa Damai. The seminar takes place from Febuary 24 – March 12, 2013. Using a variety of learning techniques and strategies this workshop will present Permaculture with various applications in mind. Class time will consist of traditional lectures, group discussions, game, exercise photoshows and movies. Teaching focuses on land systems with hands on work in the gardens at Jiwa Damai. Furthermore this course teaches how to integrate and use Permaculture in ‘Invisible structures’ those social, cultural, political and economic structures that shape much of our world today. 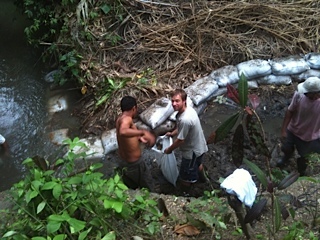 For more information regarding the Permaculture Certification Seminar, please visit our website: www.jiwadamai.net.